I’m already big fan of semi-homemade vegan recipes—those concoctions that rely halfway on all of the great plant-based products that are available these days, and halfway on homemade touches. With New York suspended in a heatwave, and my desire to cook already relatively low, I’m more partial than ever to these kinds of meals. 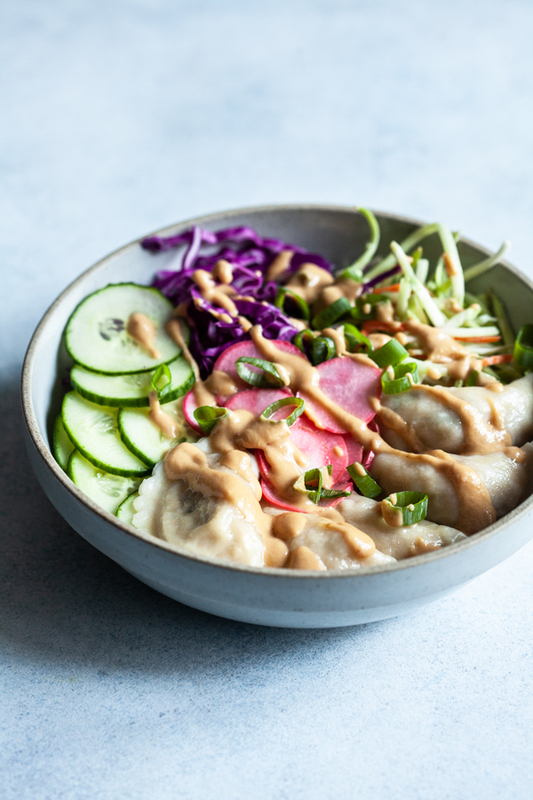 This vegan dumpling bowl with quick pickled radishes & almond miso sauce is a new favorite option. Dumpling bowls! How has it taken me so long to find my way to this idea? My homemade bowls always have at least one source of complex carbs/starchy things, usually grains or pasta or potato. 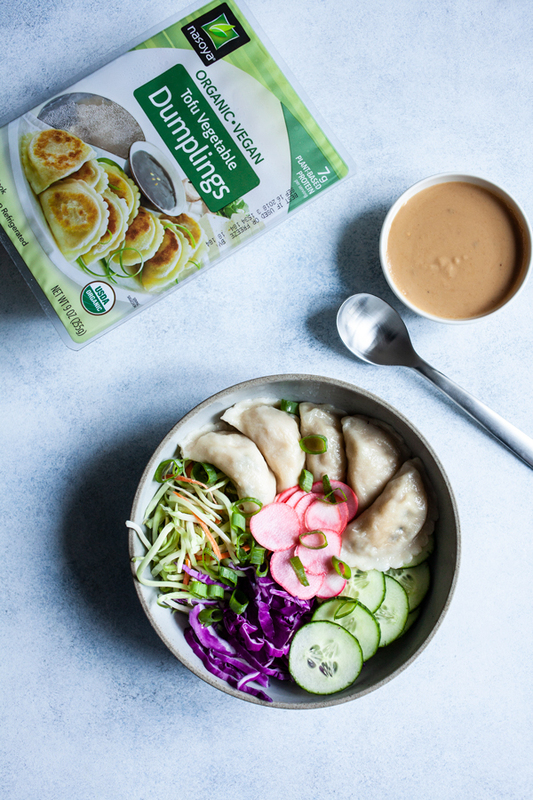 Dumplings are another great option, and these particular dumplings have the added bonus of plant protein. These are Nasoya’s organic, vegan tofu vegetable dumplings, which are brand new. 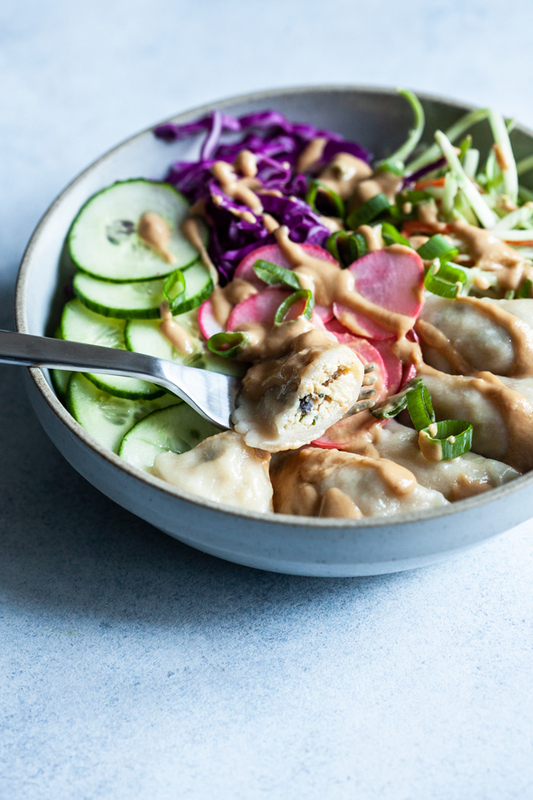 Part of why the dumpling idea hadn’t occurred to me until now is that I haven’t had a great, go-to, store-bought vegan dumpling option! Most options are sold frozen, but Nasoya’s are fresh, ready-to-cook and take only a few minutes to prepare; you can pan fry, steam or boil them, depending on your tastes. The tofu vegetable flavor, which is featured here, includes mushrooms, scallions, and tamari. It’s mild enough that you can pair it with a bold sauce, but flavorful enough that the vegetables and seasonings are definitely detectable. The brand has also released a Thai basil flavor, which I’m excited to try next. The super firm tofu makes for a tender, but substantial filling, and it adds both protein and calcium to the product. 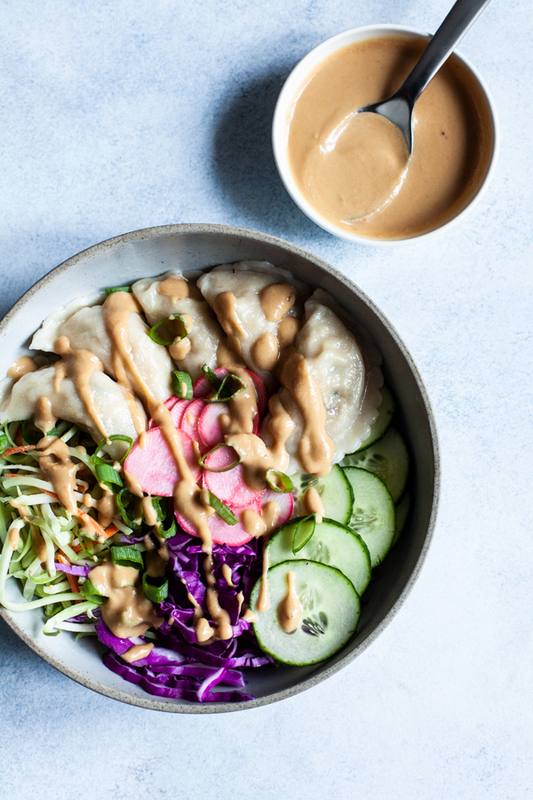 I kept the rest of these bowls simple and as hands-off as possible: raw veggies, quick pickled radishes for a tart, zippy bite, and a tasty almond miso sauce that’s adapted from the spicy miso dressing in Power Plates (a favorite of mine). The dumplings are flavorful and satisfying, and they play nicely with some otherwise fresh and crispy accompaniments. I’ve been a fan of Nasoya’s products for a long time; the extra firm tofu is my go-to. I’m excited to see the brand expanding its ready-to-eat options, bringing plant protein to kitchens in fun, tasty, and accessible ways. Can’t wait to keep playing around with the dumplings—they might just become my standing option for a last minute appetizer. It’s been a long week here, and I have to admit that my resolutions of groundedness before the DI begins were challenged by getting my first two placements. But I’ve kept things in perspective, I think, and I’m excited that the weekend is here. See you for the usual roundup. This post is sponsored by Nasoya. All opinions are my own, and I love this go-to brand of tofu and Asian-inspired foods! Thanks for your support. You had me at dumplings, lady. Awesome dinner! I can only find veggie dumplings here (I buy them at Costco) so added edamame for protein. The rest I prepared as written. Delicious! I hope I can find these! Great post. Thank you! 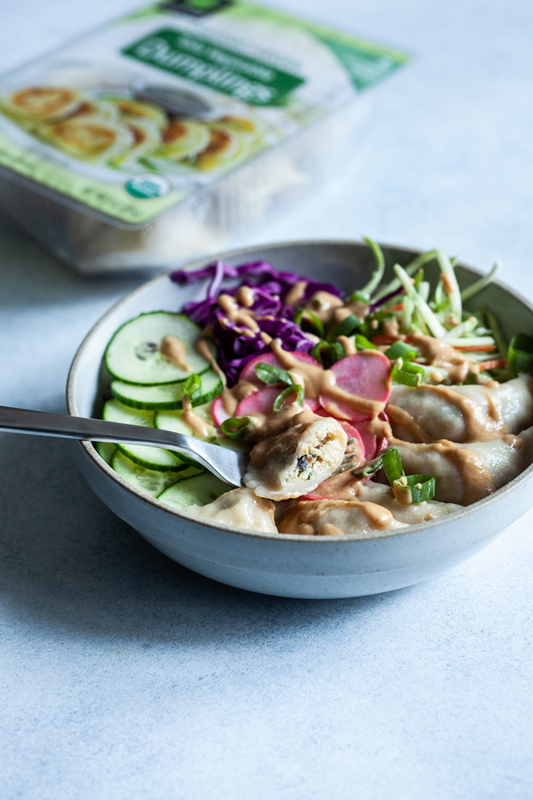 I love the idea of using dumplings in a bowl. It adds value to the dumplings and more flavor to your bowl of veggies! YUM. 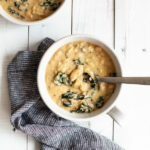 im loved this amazing recipe, it is a must try for everyone and i will definitely try it someone soon! 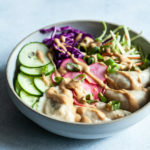 These dumpling bowls look so delicious! I love how the almond miso sauce looks too. Can’t wait to make this!